This has been a heady week of Pride and Prejudice blitz from the media and bloggers celebrating the 200th anniversary of its publication on Monday, January 28, 2013. There have been so many articles, interviews, read-a-thons, television news segments, and Internet chat about Jane Austen’s “darling child” that even this confessed Austen obsessive is overwhelmed and unable to keep up with all of the festivities. I was shocked to hear another Austenesque author tell me that she was sick of it. “What?” I exclaimed incredulously. “No! This is great for Jane’s fame and for authors,” I told her defensively. She shrugged and agreed. It is very gratifying to me to see my favorite author so amply admired by so many and honored by scholars and the media. In a world filled with so much uncertainty and unrest, Pride and Prejudice is indeed a truth universally acknowledged. I think it will be around and venerated as long as people value pithy dialogue, intelligent, spunky heroines, honorable heroes, and compelling love stories. If I had to narrow down why it is my favorite novel, I would say because it is such a chameleon: after repeated annual readings over thirty plus years, I always come to the final passage with some new insight and a calming satisfaction that some things in life are constant. Our friend and Jane Austen Made Me Do It short story contributor Jane Odiwe is interviewed by the BBC. Jane, the author of four Austen-inspired novels, and numerous illustrations of her favorite Austen characters and scenes, admits to being obsessed with Jane Austen to the world. Brave, Jane. We love you! “To mark the 200th anniversary of Pride and Prejudice, novelists, moviemakers and scholars are releasing a flood of new homages to cash in on the bottomless appetite for all things Austen.” The Wall Street Journal interviews Austen authors Sharon Lathan and Paula Byrne, publishers Oxford University Press, HarperFiction and Sourcebooks, scholars Juliette Wells and Claudia Johnson, and fan Meredith Esparza for this extensive article about Austen’s enduring appeal. Wowza! It got a full page spread in the print edition. Go #TeamJane! There are thousands of editions of P&P (it seems) and we love to discover cover designs, old and new. This article in the The Atlantic Wire shares many of the good, the bad, and the horrid, including ones that I included in a post My Top Ten Pride and Prejudice Covers that I wrote in 2010. I guess I was ahead of the trend. Like this is a surprise? The Telegraph (UK newspaper) offers up this cream puff of a piece on a truth already universally acknowledged by any Janeite worth their weight in syllabub. 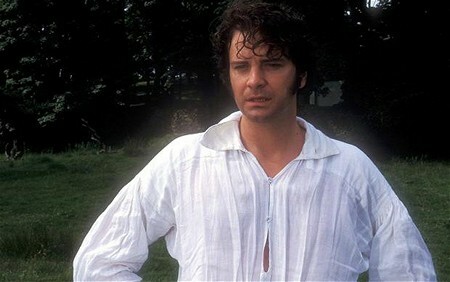 *yawn* We still like seeing wet shirt Darcy and enjoyed the history of his on screen persona thank you very much! Professor Karen O’Brien, Austen expert, Pro-Vice-Chancellor (Education) and Professor of English Literature at the University of Birmingham, explains why Pride and Prejudice’s appeal has spanned two centuries – and is still growing. Pride and Prejudice is an enduring classic because it is really about the human instinct to pursue happiness, to insist that happiness is something we are all entitled to (no matter what the Lady Catherine de Bourghs of this world tell us) and to believe that those who are generous, affectionate and self-aware stand the best chance of becoming happy. The love story is fundamentally about that path to self-awareness, and how a genuinely intimate relationship is a mutual journey in which we come to know ourselves, each other and the world. 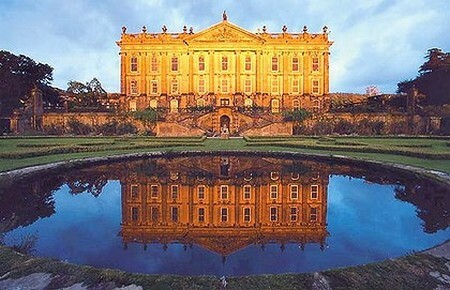 We are reminded of Austen’s rub of Birmingham in Emma. I think they have forgiven her. How would the Netherfield ball play out on Twitter? Austenesque author Lynn Shepherd’s delightful imaginings of a Twitter feed if the Bennet girls could tweet and Darcy could DM. Even Mr. Collins has his say. How he condensed his flowery soliloquies down to 140 characters is quite a feat. 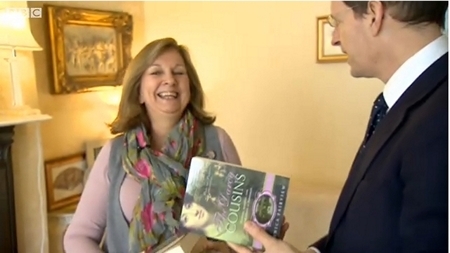 BBC News interviewed Janeites and scholars about the phenomenon of Pride and Prejudice and Jane’s fame here in America including blog mistress and author Myretta Robens of The Republic of Pemberley, professor of English Literature at Princeton University and esteemed Austen scholar Claudia L Johnson, and me. Yes, you read that correctly. ME. In our best imitation of Mr. Collins, we were very humbled that the esteemed BBC condescended to interview us on such an auspicious occasion. Which—leads me to my own personal Pride and Prejudice 200 encounter at work on Wednesday with a non-Janeite sent on an errand by his teenage daughter. Customer: Do you have a copy of Pride and Prejudice? Me: *smiles* Why yes, we have several editions. Is this a gift or for yourself? Customer: It’s for my 14-year old daughter who has never had an interest in reading classics before. She gave me this news article and asked for this book too, written by some Jane Austen cultist who lives in our hometown of Snohomish. Me: *Nods in stunned silence. Looks at article. * Yes, I am familiar with the article and the book. Customer: Really? What a coincidence! Me: Monday was the bicentenary of the publication of Pride and Prejudice. It was all over the media and television. *walks customer over to Austen shelf in fiction and then to anthologies for Jane Austen Made Me Do It. Customer: *points at cover of Jane Austen Made Me Do It* Do you know anything about this book? Me: *pregnant pause* I do. I am the Jane Austen cultist who lives in Snohomish. Me: *calmly smiles* I hope she enjoys both books! 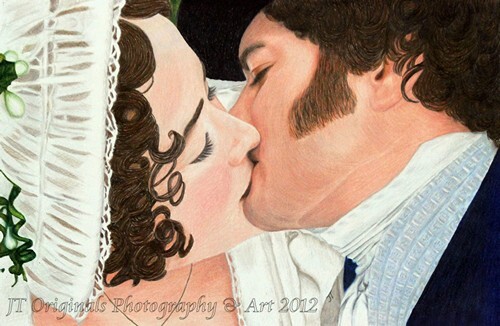 Happy bicentenary Pride and Prejudice! If you would like to continue the celebration with us here at Austenprose, please join The Pride and Prejudice Bicentenary Challenge 2013. We are reading Jane Austen’s classic and many Austen-inspired sequels, viewing movie adaptations and other diverting entertainments with great giveaway prizes all year long. The more annoyed I get with Downton Abbey, the more I recognize the timeless value of Austen. Oh Laurel Ann that cultist story!! You made me tear up! Love love love. Your vivid description of a close encounter with a non-Janeite is really a gem. Thank you for sharing it with us. With all the celebrations of P&P 200, it can be a bit overwhelming, but eventually, I’ll get to all the posts. You must definitely give yourself a pat on the back for spreading the word. Your blog brings so much of Jane’s world (and its interpreters) into focus. Thanks, Laurel Ann. I have Janet Taylor’s calendar, and it is beautiful. Every P&P lover should have one. With all the celebrations of P&P 200, it can be a bit overwhelming, but eventually, I’ll get to everything. You should give yourself a pat on the back. Your blog expands Jane Austen’s world, and you do so with such grace and generosity. I have Janet Taylor’s calendar, and it is beautiful! I can’t decide if I like the label “Janeite” or “Jane Austen cultist” more now. That is a priceless story! Now if the label of “click lit” could just be forgotten the world would be a better place. You are a celebrity! What a funny encounter, but how wonderful to be able to introduce a new reader, and a teenager at that, to all things Jane. Greta – I live to convert some unknowing soul into reading Jane. My motto is “Off to sell Jane Austen to the masses.” This experience with a non-Janeite was particularly gratifying. I envy that young 14 year-old girl the experience of reading P&P for the first time and an so touched that I played a small part in it. Yes, Katie, we are now a certified cultist. What happened to the claim that this novel is a comedy of manners? That’s pretty impressive sounding to counter attack the chic-lit ignorant people. Loved, loved, loved the story of the non-Janeite. I can’t help feeling that he was being very rude to learn you were the author and all he does is walk away laughing. What exactly was he laughing at? Was he amused that he’d met the actual author or was he laughing at your statement that you were the cultist who wrote the book he sought? I suppose what I’m trying to do is defend your honor here. This was a great post. I hope the daughter reads P&P and your book and then comes back to the store to meet the real author! Also, I hope she goes on to read the rest of our dear Jane’s novels, etc. Great story about your encounter with the non-Janeite, Laurel Ann. Thanks for the list of some of the highlights from last week, and congrats on the BBC interview. It has indeed been hard to keep up with everything that’s been said about P&P recently. I can’t help but think of poor Fanny Price — I don’t expect the anniversary of the publication of Mansfield Park next year will be accompanied by quite as much hoopla. But I suppose she wouldn’t want that much attention. I agree with you that the festivities have been great “for Jane’s fame and for authors.” How wonderful to inspire one reader at a time to begin to read Austen. Like you, I am always excited when I feel as if I have recruited a new JA reader. I feel totally responsible that they understand the little nuances. I get so excited at the prospect of a fellow fan! But they tell me they are struggling reading her style of writing, often my next step is to offer one of my audio books. Sometimes hearing her words, the cadence, the intonation– the intent seems to be more understandable– so when they do attempt to read it again, the words just seem to come off the pages and to life. Sometimes it works. I just want everyone to love her works as I do. Hopefully I don’t turn people off with my enthusiasm. LA – The story about the customer buying your book? LOVE IT. So proud of you and all you’ve accomplished! Thanks Kim, you are so kind. Hear-Here! I promote JAMMDI at every opportunity. I can just pick it up, blindly turn to any short story, and be pleasantly diverted into another world.